We love Gmail, but it's way easier to work in one screen rather than having several screens with all your options open. Therefore we support a full Gmail integration. You can send and receive all your email directly from Lily. 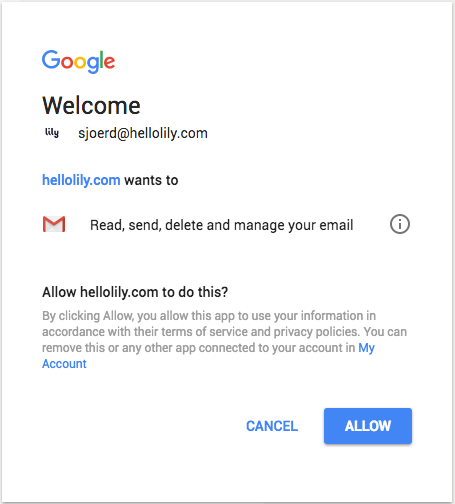 It's really easy to add your Gmail account and before you know it, all your email is in Lily. One of the advantages is that everything you need for email communication is right there. Go to the top-right in the Lily screen and click on your picture to open the second menu. Click on Add email account. Log in and select your Gmail address. Share your email account with all or specific colleagues. Read more about how and why to share your email here. All set, ready to rock. Once saved, it takes a few minutes to fully load all your email into Lily. To collaborate easily and efficiently with colleagues, we suggest sharing all email with your colleagues. You can now choose what to share with your colleagues: the whole mailbox, emails in timeline, just the metadata or nothing. Click to read more about those options. If you need help or have questions regarding Gmail integration, never hesitate to contact us. We'd love to help you out!